Inn on Mill Creek has two buildings, the Main House and the Deck House, each with three guest rooms. The Main House and the Deck House are separated by the Pool Garden, a lovely perennial and herb garden that was formerly a swimming pool! Frequently chosen for romantic and/or extended getaways, the 600 sq. ft. Evergreen Room is our largest room, located on the second floor of the Main House. This expansive king bed room with a 14′ peak rough-hewn cedar ceiling has full-length windows gracing the entire south wall for beautiful views of the forest, garden spaces and the peaceful pond. Other features include a woodstove-inspired gas fireplace, writing desk, and 32″ HD-TV with DVR as well as a DVD player. Enjoy your favorite beverage on the screened porch and take in the fresh mountain air. The dressing area leading to the private bathroom has double sinks under a skylight and enters the private bathroom “in the trees” that was updated in 2015, with a large walk-in tile shower and jetted spa air tub. Situated on the ground floor of the Main House with its own patio/parking area and private exterior entrance, the 500 sq. ft. Oak Leaf Room is one of our most requested rooms for travelers heading to the Asheville area. This king bed room has a vaulted knotted pine ceiling, contemporary gas fireplace, writing desk, and flat panel HD-TV with DVR and a DVD player. A sectional sofa provides plenty of space for lounging, and has a full-sized sleeper sofa for one additional guest. One wall of the large private bathroom features copper-accented stenciling using leaves from the property. 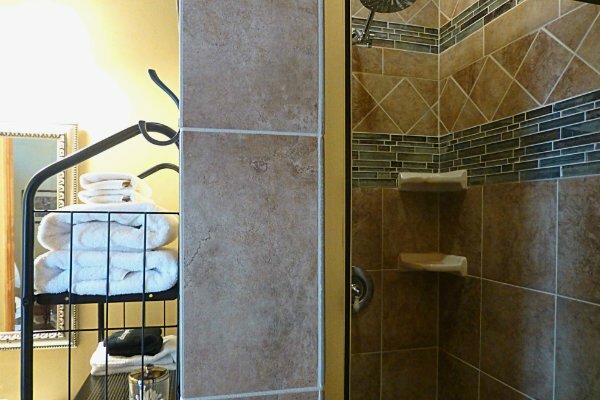 The bathroom has a spacious walk-in tile shower, generously-sized jetted spa tub for relaxing after a day of hiking or sightseeing, dual sinks, and heated floor tile. The Oak Leaf Room is pet friendly, sharing no common walls with other guest rooms. A third guest may be added for $25/night. 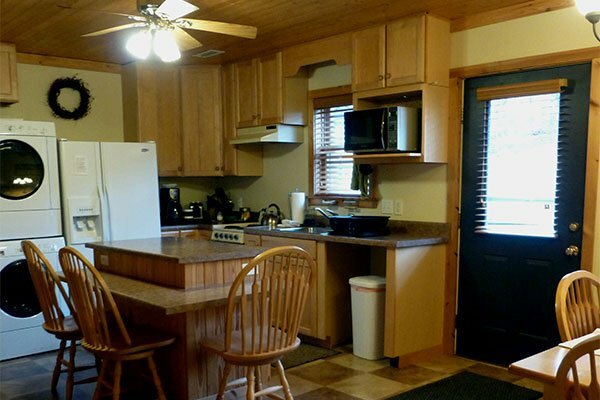 Nature lovers on a getaway to the Black Mountain area love the 400 sq. ft. Mountain Laurel Room, located on the northern side of the Deck House. It’s also one of our two family friendly accommodations. The room’s king bed has a hand-crafted headboard. A hand-painted tree mural over the bed was inspired by the Inn’s location inside Pisgah National Forest. Read, watch or DVR your favorite TV show, or enjoy watching nature while lounging on the double-recliner loveseat. A woodstove-inspired gas fireplace takes the chill off on cool evenings in fall and winter. The private double-vanity bathroom has a double Jacuzzi tub and spacious tile shower. The Mountain Laurel Room also has a sleeping loft, with a 4.5-foot ceiling and a full-sized bed for an additional guest. The room is accessed through the Deck House’s full kitchen, which is available for use by guests in that building. The room’s sliding glass doors exit to the deck that runs the length of the Deck House. Add $25 per person, per night, for additional guests. Tucked away on the south side of the Deck House, the Maple Tree Room is a favorite for couples wanting to escape the hustle and bustle, and is also one of our two family friendly accommodations. This 400 sq. ft. room has a queen bed and a loveseat for relaxing and watching TV (which includes DVR). 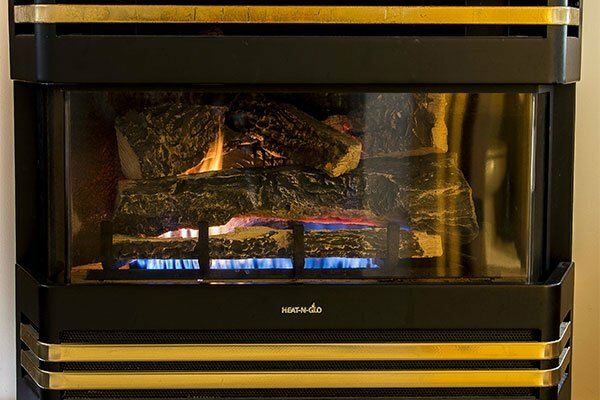 A woodstove-inspired gas fireplace is popular in cool weather months. 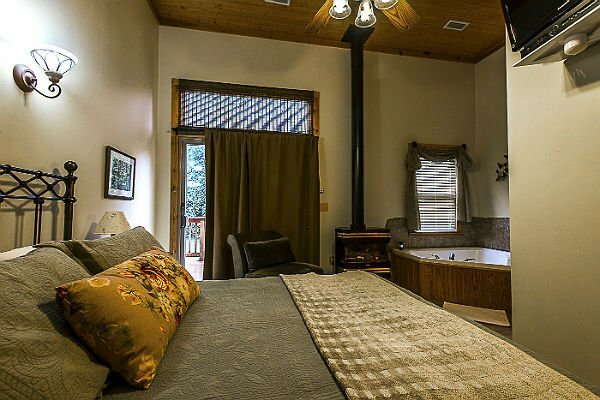 The private double-vanity bathroom has a double Jacuzzi tub as well as a roomy tile shower. The Maple Tree Room also includes a sleeping loft with a 4.5-foot ceiling and a full-sized bed for an additional guest. Add $25 per person, per night for additional guests. The spacious Carolina Room is on the second floor of the Main House, on the northeast side of the house where the creek babbles along the gully below (obscured by lush foliage). Wake up to lovely views of the woods surrounding the Inn from windows on three sides. The room features a king bed, with a split-twin bed option for guests who prefer two separate beds. A writing desk and seating area provide comfortable space and an accent heater with fireplace motif creates nice ambiance. The Carolina Room also has satellite HD-TV with DVR and DVD. The cedar lined private bathroom has a skylight and features a deep, single Jacuzzi tub and a separate tiled shower. Please note, the Carolina Room is not pet friendly. The petite Azalea Room has been set aside for our solo travelers to the area and has a maximum occupancy of one guest unless it is being used as an add-on room for groups who would like to reserve all three rooms in the Deck House or more than five rooms at the Inn. 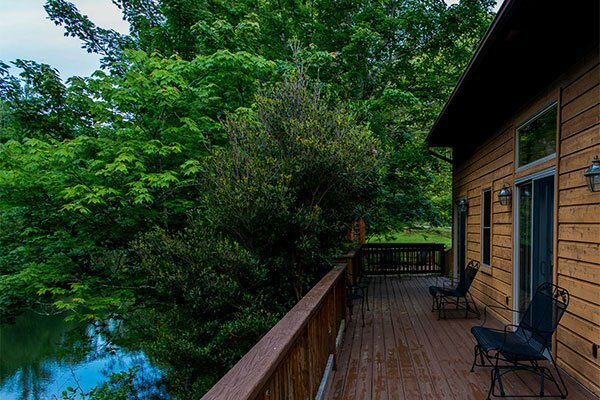 Situated between the Mountain Laurel and Maple Tree Rooms in the Deck House, the 240 sq. ft. room has a queen bed, woodstove-inspired gas fireplace and HD LCD satellite TV. The private bathroom has a pedestal sink and glass enclosed tile shower, while a large Jacuzzi tub is tucked away in the corner of the bedroom. The Azalea Room is accessed through the Deck House’s full kitchen, available for use by guests in that building. The room’s sliding glass doors exit to a deck that runs along the rooms of the Deck House. Enjoy a 10% discount on stays of three or more nights from April through December. Other room rate discounts can be found on our specials/events page. There is generally a two-night minimum on all reservations. Please see our policies page for information about single night reservation requests. Rates may vary due to seasonality and weekend vs. midweek stays, as well as holidays and events, and are based on double occupancy unless otherwise indicated. North Carolina state and county sales taxes (6.75%) and McDowell County room tax (5.0%) will be added to your room rate when you make your reservation. Want to make a group reservation? Check our specials/events page for details.